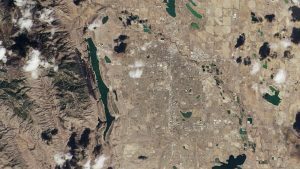 First Landsat image acquired in 2013 showing area around Fort Collins, Colorado. Data courtesy of NASA/USGS. The Landsat programme achieved a couple of significant milestones over the last two weeks. Firstly, the 11th February marked the five year anniversary of the launch of Landsat 8 which took place at the Vandenberg Air Force Base, California, in 2013. The image to the right is the first one acquired by Landsat 8 and shows the area around Fort Collins, Colorado with the Horsetooth Reservoir very clear left of centre. This anniversary is an interesting one because Landsat 8 was only designed for an operational life of five years. Obviously it has already exceeded this and these planned lifespans are very conservative. More often the amount of fuel on board is a more relevant assessment for lifespan and for Landsat 8 the initial assessment was a 10 year lifespan. However, even this tends to be a conservative estimate. As an example, nineteen years ago Landsat 7 was launched with similar planned operational lifespans. It is still working today, although there have been some degradation issues, and IT achieved its own significant milestone on the 1st February when it completed its 100,000th orbit of the Earth. Landsat 8 is in a sun-synchronous orbit at an altitude of 705 km, circles the Earth every 98.9 minutes and in the last five years has undertaken over 26,500 orbits according to NASA who have produced a short celebratory video. The two final bands focus on coastal aerosols and cirrus clouds. With the exception of the highest polar latitudes, Landsat 8 acquires images of the whole Earth every 16 days which has meant it has acquired over 1.1 million images of the Earth that accounts for 16 percent of all the data in the Landsat multi-mission archive. 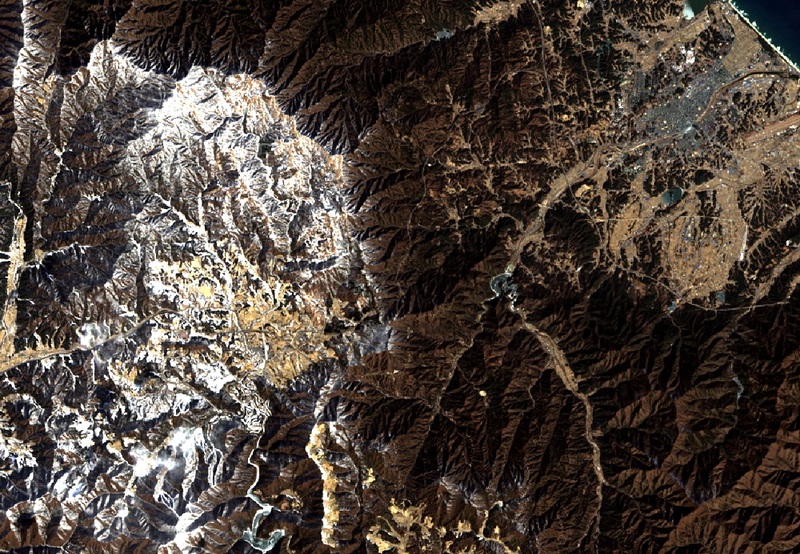 Landsat 8 image of Pyeongchang, South Korea, which is hosting the 2018 Winter Olympics. Data acquired 11th February 2018. Data courtesy of NASA/USGS. 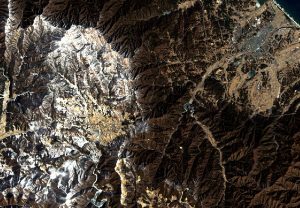 The image to the left is the Pyeongchang region of South Korea where the Winter Olympics are currently taking place acquired by Landsat on its five year anniversary on the 11th February. Pyeongchang is in the north west of South Korea in the TaeBaek Mountains just over one hundred miles from the capital, Seoul. The left area of the image shows the mountain range where the skiing, biathlon, ski jumping, bobsled, luge and skeleton events take place and to the right is the coastal city of Gangneung, where the ice hockey, curling, speed skating and figure skating are taking place. With its forty-five year archive, Landsat offers the longest continuous dataset of Earth observations and is critical to researchers and scientists. Landsat 9 is planned to be launched in 2020 and Landsat 10 is already being discussed. Congratulations to Landsat 7 and 8, and we look forward to many more milestones in the future. Will You Have To Pay For Landsat Data? This entry was posted in Data, Earth Observation, Landsat, NASA, Olympics, Remote Sensing, Satellite, Space Industry, Understanding Space and tagged 000 orbits, 100, 2018 Winter Olympics, Colorado, Earth observatio, Fort Collins, Landsat, Landsat 10, Landsat 8, Landsat 9, Landsat-7, NASA, OLI, Operational Land Imager, operational lifespan, Pyeongchang, South Korea, Thermal Infrared Sensor, TIRS by Andy. Bookmark the permalink.